Francis Otolo is a Registered Organizational Excellence Specialist and a member of the research team at OES participating on the ‘first global assessment on the current state of organizational excellence’ that was launched by the OETC and has been supported by the GBN, ISO/TC 176 and International Academy for Quality. As a manager of Quality or Organizational Excellence, he has helped organizations across industries to leverage concepts, methods, models and unique ideas to make sustainable improvements, generate more revenue and remain relevant and to achieve strategic, product quality and operational excellence imperatives. Francis has designed and implemented Integrated Management Systems to meet ISO 9001, OHSAS 18001 & ISO 14001 standards in organizations of different sizes and assisted clients such as Total, Shell, and Mobil in meeting Operation Integrity Management System and Safety Health & Environment requirements. 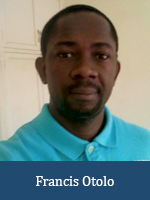 Using quality management and lean practices, he currently does experiments on the African farmed catfish for farmers and undertakes consulting engagements with schools helping both these groups to improve performance and strive for excellence.